Remember that Anaconda movie, which Jennifer Lopez and Owen Wilson starred in? The 1997 hit gave fruitful ground for numerous sequels and remakes, and all sorts of artistic musings on the subject of monsters creeping from the swamps. Now, Swamp Attack here doesn’t have J Lo, alas. Instead, it has an ugly fat white guy with bad teeth, wearing dirty jeans and sweat-stained sleeveless t-shirt that used to be white. He lives in an old hut in the middle of a swamp, all alone, which comes as no surprise. The guy desperately needs a shower and a haircut, but he couldn’t care less for all that glitz. He likes to smoke, drink beer, rock in his old chair and spit in the swamp. He likes country music and his oily old hat. He likes his shotgun, too. Here’s another bunch of reasons why the game is stranger than Stranger Things. Enter the zombies. This time, however, they are zombie reptiles and insects all sorts of swamp wildlife seems to have gone crazy. They come in hoards, slowly advancing, but nonetheless lethal. Their gazes are fixed and reflect nothing but the obvious hunger for blood. At some point, our guy has to confront the UFO, which must be responsible for zombifying the animals in the first place. Our un-likely hero has his virtues, though. He is as cool as ice, and doesn’t break a sweat when the critters start attacking. Without putting down his cigarette, he loads his shotgun and starts taking the critters down, one by one bang bang! The zombie wildlife comes in great variety alligators, huge turtles, raccoons, armed rats, giant venom-spitting mosquitoes, UFOs and big ugly slobbery bosses with lipstick-painted lips. Even though they approach at a steady slow pace, the guy needs time to shoot and reload his shotgun, so at some point, the ghastly reptiles get to him. Luckily, the developers made it look like the monsters chew at the porch steps, while in fact they are chewing the guys feet. Why would his energy bar sink at the same time, otherwise? The more he kills the creatures, the more rewards he gets, and the more golden coins he collects. Rewards come in great variety dynamite, Molotov cocktail, potions and other boosters that can make a nice swamp barbecue of alligator steak. The game play is overly enjoyable and quite addictive, yet challenging. Only the first few levels are piece of cake, so after the introduction you’ll have to load the guy with ammo and defensive structures. There are four episodes with 78 levels in total. At the end of each episode, the guy has to confront a boss. There are a few instances of UFO attacks across each episode, and those are different because the flying saucers take away all his additional ammo, leaving him with nothing but his shotgun. He has to take down the saucers to recover some of his power-ups, fighting off the raccoons and rats at the same time. The Shop offers several departments for weapons, defense, explosives and perk packs, such as double coins or reviving potions. It is possible to play without paying (IAPs come a bit on the expensive side), provided you are ok with a bit of grinding. 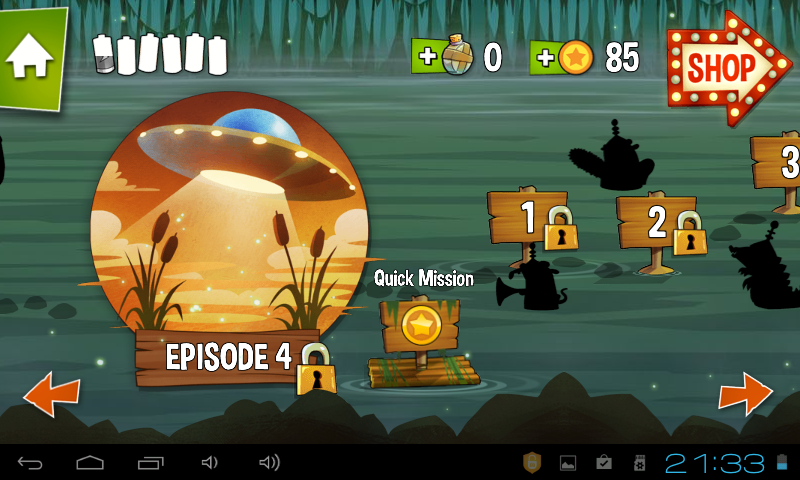 Luckily, you can go back to any level, or play a quick mission to earn some coins. You don’t necessarily need to buy weapons because you unlock them as you play, and all you have left to do is upgrade them and buy more ammo for them. Besides the mighty shotgun, there is a lightweight UZI, dynamite, Molotov cocktails, refrigerators that freeze the swamp and slow the critters down, batteries that electrocute them, and even an atomic bomb. 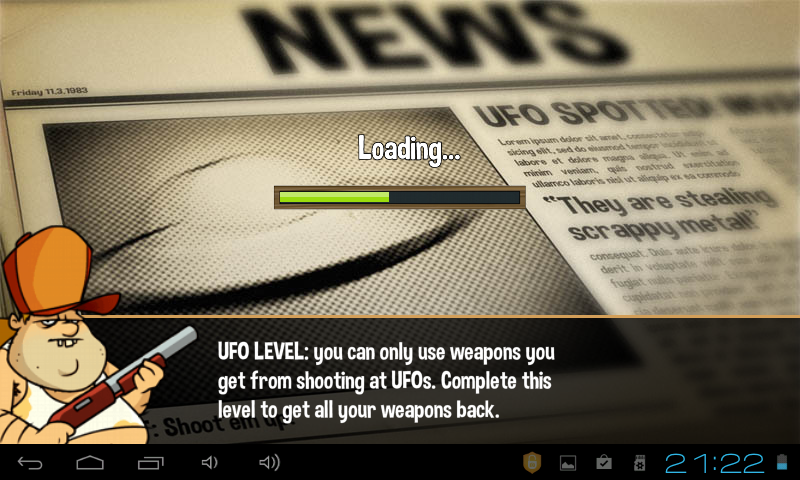 Defence tools are also unlockable and comprise a pile of garbage you can put in the swamp to slow the zombies down and even hurt them. Our guy has a limited life span, obviously, and its reflected in batteries each time he dies, one battery is emptied. Once all batteries are empty, you will have to wait for about 30 minutes for them all to be replenished, or about 3 minutes for just one to get recharged. The controls are simple you just tap on the monsters, and your guy shoots them down. The shotgun has its peculiarities, though, and you can’t just keep on tapping like crazy give him time to reload. 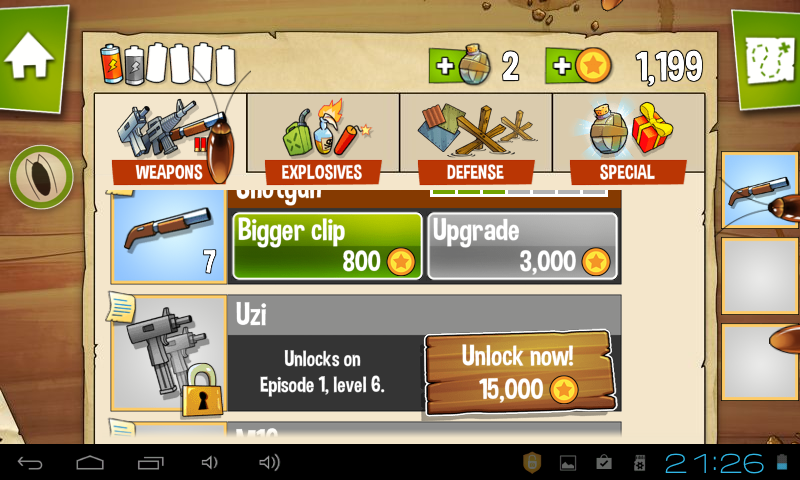 UZI does quick rounds, but its less powerful, and the ammo runs out quickly. 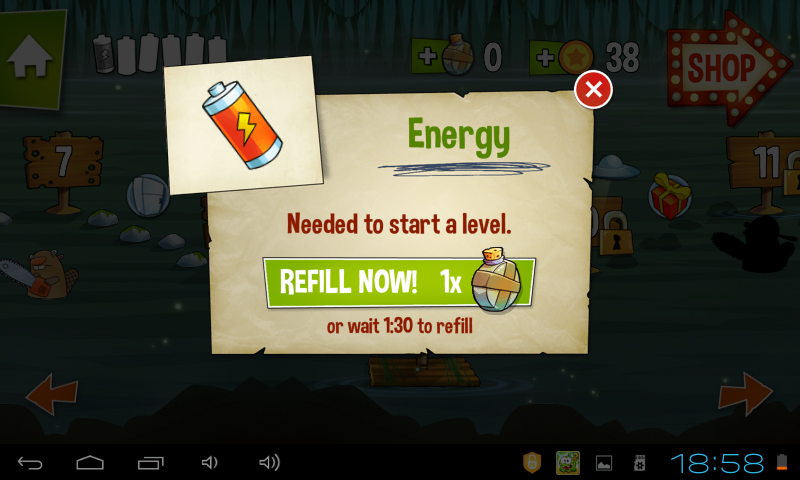 You will tap the gift boxes, coins, rubber ducklings for power-ups; applying a power-up requires you drag it on the critters. The design in Swamp Attack is cartoon-ish and quite appealing. Most importantly, its atmospheric and complemented with some nice, even relaxing, country soundtrack. Although, I would add a few songs to it, because sometimes the intense action requires a more energizing music, like Rednex Old Pop In An Oak, for instance. Sometimes, the swamp gets foggy and really scary. Designers attention to detail created a character you’ve likely met in real life. Again, exhaustible life span suggests waiting till life batteries recharge very much like in Candy Crush kind of games. If there was a choice between IAPs and ads I’d go for ads. 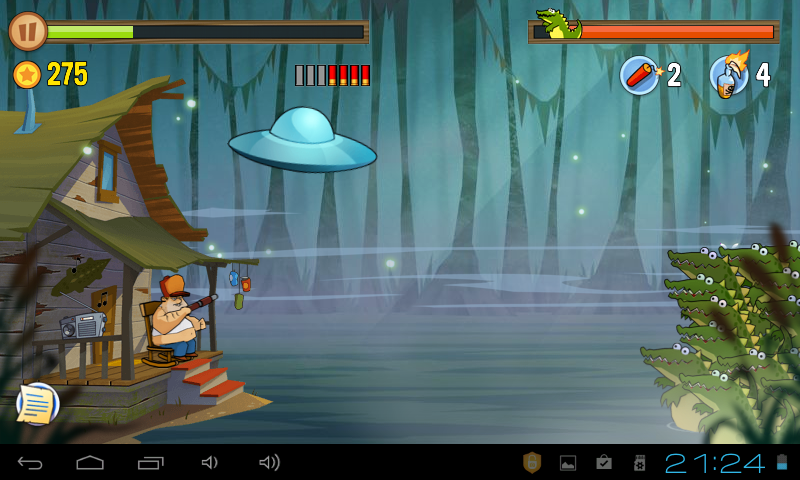 Swamp Attack is gaining popularity in both iTunes and Google Play store, and now I understand why its just fun. Players can advance steadily, but not too fast, without going bankrupt on IAPs, and the replay value is quite decent. The substantial load of levels provides enough hours of fun for any purpose, be it a 5-minute break, or a 30-minute commute back home for a week or two. Overall, its a thoroughly enjoyable time-killer with a peculiar American charm, if there is such a thing. It is free to play, and we recommend it wholeheartedly for download. 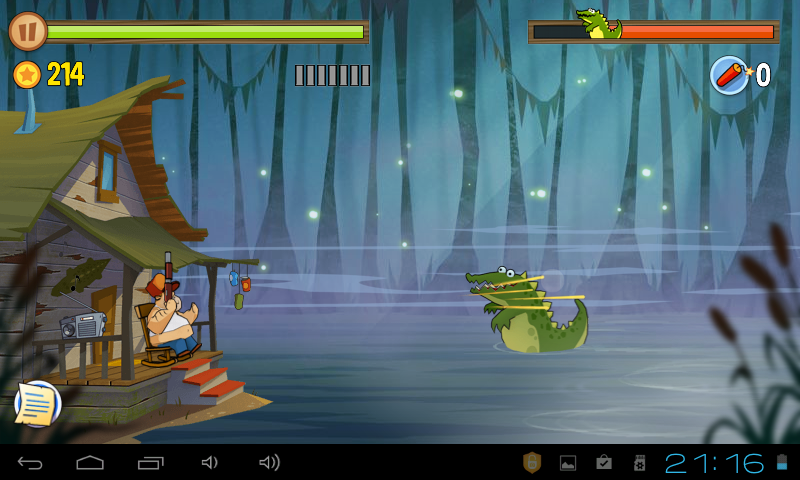 Download and play Swamp Attack today!